Send Chocolates and Cookies as a Token of Sweet on this Raksha Bandhan: This segment has Cookies and assortment of Chocolates like: Cadbury Celebration, Ferrero Rocher, Homemade Chocolates, Nestle Chocolate Hamper etc. - RakhisOnline.com. 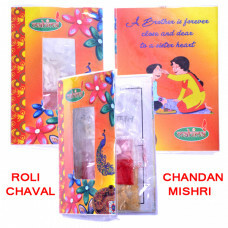 Jewel Rakhi 200 Gms Cashew (Kaju) 200 Gms Almonds (Badam) 04 Ferrero Rocher Chocolates 01 Dairy .. Jewel Rakhi 100 Gms Cashew (Kaju) 100 Gms Almonds (Badam) 06 Ferrero Rocher Chocolates 01 Dairy .. Jewel Rakhi 100 Gms Cashew (Kaju) 100 Gms Almonds (Badam) 03 Ferrero Rocher Chocolates 01 Dairy ..